Bofutsushosan (BTS; fang feng tong sheng san in Chinese) is a formula in traditional Japanese Kampo medicine and Chinese medicine comprising eighteen crude drugs, and is used to treat obesity and metabolic syndrome. Fructose is contained in refreshing beverages as high-fructose corn syrup, and is associated with obesity. Fructose is absorbed via glucose transporter 5 (GLUT5) in the intestine. Therefore, the inhibition of GLUT5 is considered to be a target of obesity drugs. We evaluated the inhibitory effects of BTS extract and its constituents on fructose uptake using Chinese hamster ovary K1 cells, i.e., cells stably expressing GLUT5. 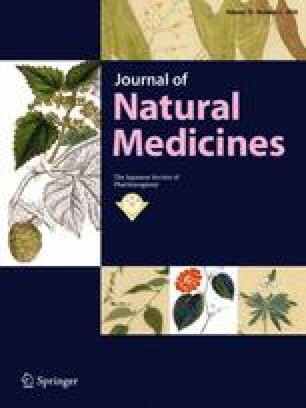 Boiled water extract of BTS significantly suppressed GLUT5 function in a concentration-dependent manner without cytotoxicities. Among 18 components of BTS, the boiled water extracts of the rhizome of Zingiber officinale, the root and rhizome of Saposhnikovia divaricata, and the root of Platycodon grandiflorum exhibited significant inhibitory effects on fructose uptake with IC50 values of 314, 119 and 475 µg/ml, respectively. Among the constituents of the rhizome of Z. officinale extract, 6-gingerol significantly inhibited GLUT5 with an IC50 value of 39 µM, while 6-shogaol exhibited a significant but weak inhibition on GLUT5 at 100 µM. One of the mechanisms of action of BTS may be the inhibition of fructose absorption in the intestine, and one of the active components of BTS is the rhizome of Z. officinale and 6-gingerol.